From Backyard Poultry to large poultry operations, we are ready to take care of your needs. Chickens, Ducks, and Turkeys - we special order our customer's selections of birds through Sunnyside Inc. We have brochures available for bird details, pictures, prices, and delivery dates. New This Year: Sunnyside Rainbow Eggers - a colorful collection of commercial layer strains from Europe that will fill your egg basket with a green, blue, chocolate brown and cream-tinted eggs! Please allow a minimum 2 weeks lead time when ordering, as the hatchery does sell out early on the most popular delivery dates. We stock several types and sizes of waterer containers, depending upon your flock size. - plastic bases sized to used with a quart jar or a gallon jar. We do sell gallon plastic jars. - Electrolytes - specifically formulated as an additive for use when animals are subject to conditions of stress, such as being transported and being moved into their new home. - Probiotics - as a digestive aid. we stock both). Sunnyside also states to advoid newspaper or straw, as they could cause leg problems. - Heat Lamp - Start new chicks at 95o, lower 5o weekly until room temp. - 14" round metal feeder that holds 30 pounds of feed. Other sizes are special order. Feed - The first decision is organic or traditional feed, which is your option. We stock both options and can special order specific feeds. For large operations, we produce the feed mix in our mill for pick up or delivery. We carry Starter feeds, Laying hen feeds, Scratch Feed Grains, and Broiler/Meat bird feeds from several sources + we produce our own mix of Laying Mash that is widely used in the area. 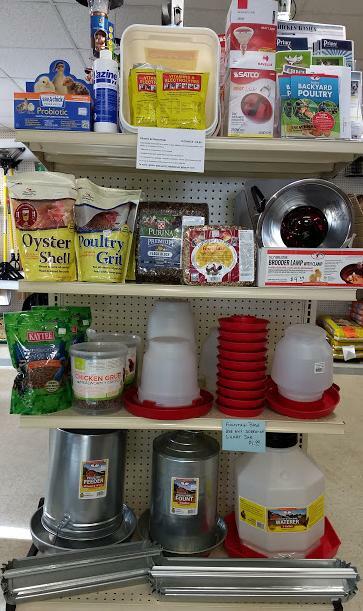 We also carry Game Bird Feed, Turkey Feed, and an All Flock Feed. - Chicken Grub - 100% Nutritious. Delicious. Bugs. - Flock Block - for free range poultry and game birds. - Forage Cakes - stimulates natural foraging activity. - Mealworms - at nearly 50% protein, a great treat. - Oyster Shells - supplies calcium for strong shells. - Poultry Grit - aids in digestion to help keep your birds happy + healthy.